P&B Weir Electrical Ltd’s range of Transmission Line Earthing Operating Poles is suitable for temporary earthing of transmission line conductors within the range 132kV, 275kV and 400kV. The two part Transmission Line Earthing telescopic pole has an extended length of 4.83m (15’ 10”) and a closed length of 2.55m (8’ 4”). Intermediate spring loaded locking pegs provide partially extended lengths of 4m (13’ 1”) and 4.4m (14‘ 5“). The pole requires an OL1 operating socket for the application of our line end clamps with long taper style operating screws. The lower end of the pole has an open weave hand grip bonded to it. A carrying sling can be provided or, alternatively, an end plug with swiveling wrist strap can be supplied which (upon removal) provides location for a 1.83m (6’) extension pole. 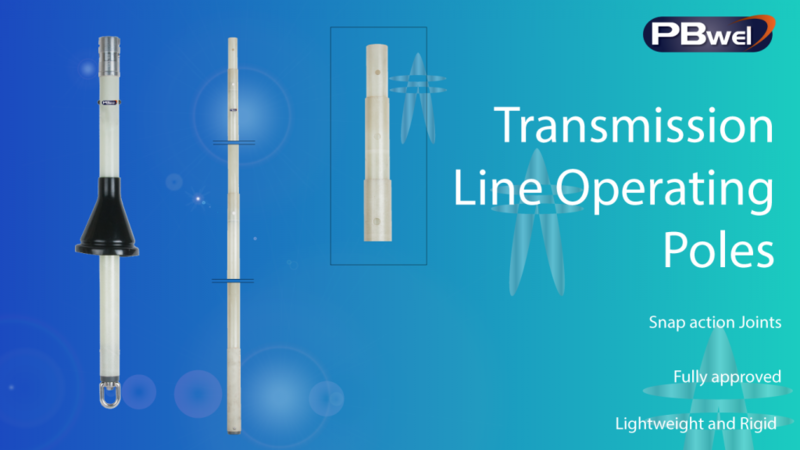 The TL1 telescopic pole comprises three close fitting tubes resulting in a fully extended overall length of 7.2m (23’ 7”) and a closed length of 2.55m (8‘ 4“). The Intermediate spring loaded locking pegs permit intermediate lengths of 5.5m (18’) and 6.2m (20‘4“). The lower pole section has an open weave bonded hand grip. A 0.6m (2’) bridging earth pole is available with a rain shield/shed fitted above the open weave bonded hand grip and a swiveling eye fitting at the bottom of the pole. The pole employs an operating socket for application of our Line End clamps with Long Taper type operating screws. The operating poles are manufactured from a strong glass fibre material in accordance with C.E.G.B. specification 43921.